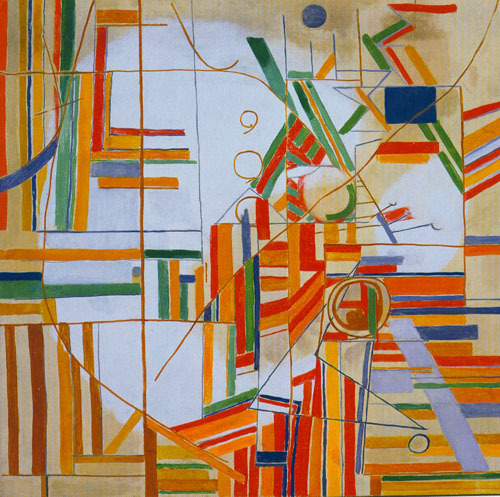 My continuing voyage of discovery among the Abstract Expressionists has lead me to the work of more women, who are, if certainly not completely unknown, then relatively obscure, despite their obvious talent. Perle Fine is one of them. 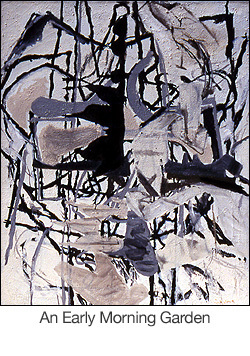 Perle Fine was born in Boston in 1908 and died in NY in 1988. In the 1930’s she studied with Hans Hofmann. 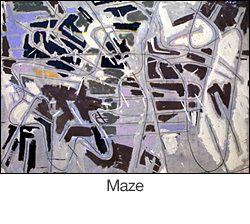 This helped her “develop an intuitive approach to painting without sacrificing the structural soundness that she felt was essential to a successful composition.” (Perle Fine The Storm Departs, Helen Harrison, McCormick Gallery, Chicago) She was as interested in geometric abstraction , a la Mondrian, as in color relationships. The landscape always served as an initial point of departure, but she was interested not in a “direct response to the surrounding environment” (Ibid. ), but in an evocation of nature that revealed “an acceptance, serene and tranquil ” (Ibid). Her work, like nature, required balance, and for Fine that meant a balanced composition. 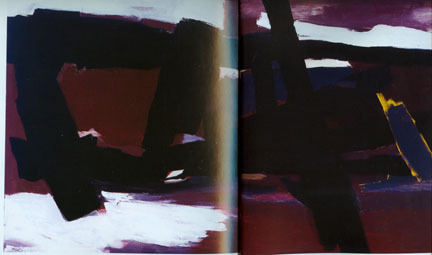 In the 1960’s she began her Cool Series which reduced both color and line to the bare essentials. 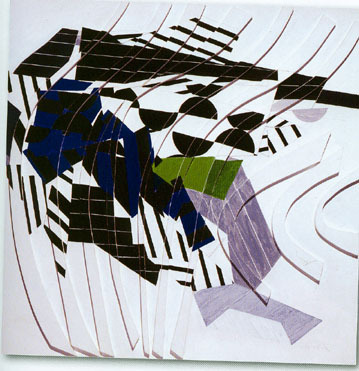 She began experimenting with collage, because she wanted the surface of the canvas, the painting to have more texture. 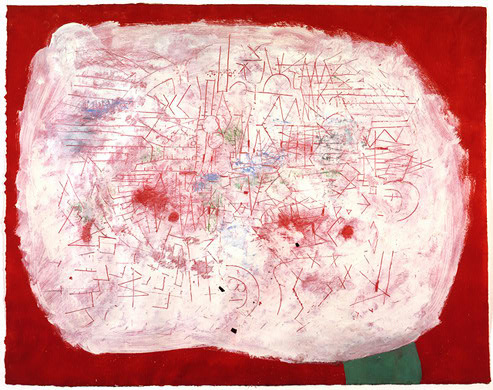 She was part of the “The Club” — The avant garde New York artists of the late 40’s. Yet despite having been one the the first generation of Abstract Expressionists, and having had over 150 solo and group exhibitions, fame did not come to her. She taught generations of artists at Hofstra University, and was known for both her control of positive and negative space as well as for her intense work ethic. She continued painting until Alzheimer’s made it impossible, 3 years before her death. I think the power of her work speaks for itself. please email me if you still have the Perle Fine. I have a beautiful Perle Fine painting that I am trying to sell I am disabled and not sure where to start. Can anyone point me in the right direction.. I live in upstate NY Saratoga Springs I will be looking forward to your comments and help. Thanks for bringing Corinne West to my attention. I enjoyed seeing her work at the NY School Art Gallery. The close ups and details are especially interesting — I’d love to see her work in person! Please continue educating us about lesser known artists. Charcoal Red is much more powerful and beautiful without the silly line my scanner makes down the middle. I also like Untitled – Cool Series quite a bit. I like when she uses really thick solid lines and chunky geometrics. A homage to Perle Fine in fabric is a cool idea — but to replicate both the solidity of her geometic objects with the blurriness and rawness of paint . . . tricky! I like the Ideomorphic Composition #1 and Cross Currents #2 the best but also enjoy the block ones. The changes through the years are so different. It would be interesting to see some of these put to fabric then set along side the painting. What surprises me is the variety of styles Fine paints in. Are there other ab. exes. who run through the same changes? I know many of the males started in the 30’s as social realists (ala Russian Constructivists, as Dijanne said about Rivera). But once they hit their stride (and their fame) they seemed to have settled in. Do the other women — Joan Mitchell? Frankenthaler? Krasner? the others whose names now escape me? guess I should go back and look at the earlier blogs Clairan has provided for us. The Cross Curents #2 is also my favorite — almost certainly because it looks like fiber! She did quite a lot with “op” like features. And her last series was very austere and geometric and would have had more warmth and strength if done with textiles, I agree. But I’d guess we’re just a teeny bit biased! You keep finding these treasures! 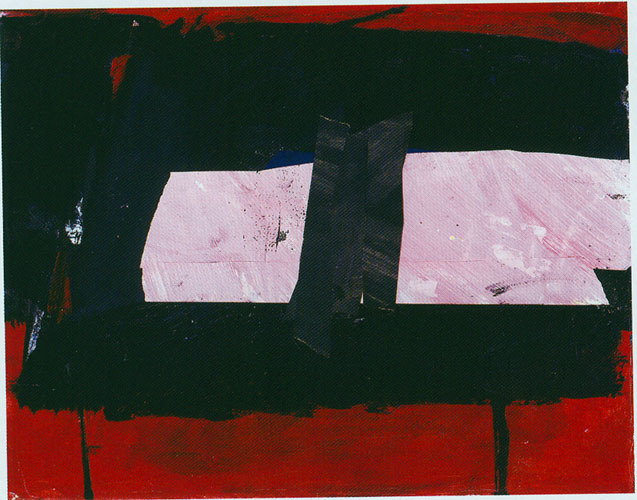 I find I like Fine’s later work better than her earlier stuff — the big blocky slabs of paint are delicious. And her wood textures are interesting — she should have gone all the way to textiles and sewn them. I hope when you are finished telling us of your discoveries that you’ll do a final compare/contrast, pulling in something of each of the women that you’ve been introducing us to. I for one could use a review and would love to see them put together.